After the loss of her husband, Gracelynn Calhoun has struggled with her life and career. Forced to take a four-week vacation or be fired from her job, she surprises everyone including herself and agrees to the vacation. 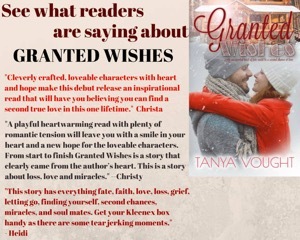 What started as a lifelong dream became a reality when Tanya Vought penned and released her debut romance novel, Granted Wishes. She is a hopeless romantic who loves reading, writing and singing. You may know her as blogger "Tanya - The Book Obsessed Momma", where she's been a loyal supporter of authors and an active participant in the book community for several years. You'll find that Tanya writes stories that are sweet, sassy and unique--like her. When she's not inspiring others with her kindness, she's spending time with her husband and two imaginative children. She believes whole-heartedly that anything is possible. If you can dream it, you can achieve it! Gracelynn happiness is swallowed up after the loss of her husband and it seems nothing can mend her broken heart. Giovanni, a handsome entrepreneur and has had his own shares of misfortunes. But there is something about Gracelynn that makes him protective, makes him want him to take away the sadness that lurks behind her eyes. There is an obvious attraction between them is apparent, but can they both put aside their past to created a loving relationship? This was a well written novel and the characters were very funny, strong and extremely likable. Thanks for your post and your review!!! So glad you enjoyed Granted Wishes!